This was my first time visiting this particular food truck, but more than likely will not be my last. Food was very good, fresh, and hot. Service was friendly, personable, and professional. Owner was providing samples of Crab Bisque which was also very tasty, especially on a cold November day. Fries were cajun, spicy fries variety. Very crispy and crunchy, not undercooked or bland. The sandwich was so/so, regular hamburger bun with lettuce/tarter sauce and piece of fish (broken in half). Nothing to write home about, the fries were soaked in grease, couldn't eat. No napkins. Won't be back.. advice: raise your food level and cooking one notch will make a big difference. I've been to this truck 3 times and each time the chicken was crispy, not greasy, and really hot and fresh. Cole slaw is nice - haven't had fries. the shrimp and fries had a nice flavor to them, it wasn't just fried and tossed into a box,they seasoned both fries and shrimp to a good amount of flavor and I will definitely go to this food truck in the future to try more things. The chicken was tasty but I found a long hair in my fries! Henhouse is a great place to get some good fried chicken and fries at a great price. An offshoot of "Tasty Fried DC", they have a similar, but slightly different flavor. It's mostly jucy (once in a while it's over cooked), and the fries are just the right mix of crispy and soft. Anytime they come by, I make sure to get some of their lovely food. Best fried chichen truck in Downtown DC. excellent service chix was hot and corn was fresh not frozen corn. Way to go Henhouse Chicken! I will promote you in Downtown DC. Second time visiting this truck, very disappointed. I got the two piece chicken and it smelled like fish. My soda can smelled of fish....The thigh had blood in the meat...Will not revisit!!! I wanted to give this truck a great review. They had a long line, but they moved fairly efficiently. The young man who took my money was polite. The fish and chips I received came out piping hot and the fish appeared nice and crispy, not soggy or overly oily. However, when I got the box back to my office and started to eat, I discovered a fatal (potentially literally) flaw: lots of bones remained in the fish filet. Whole experience = spoiled. Will not buy from them again. 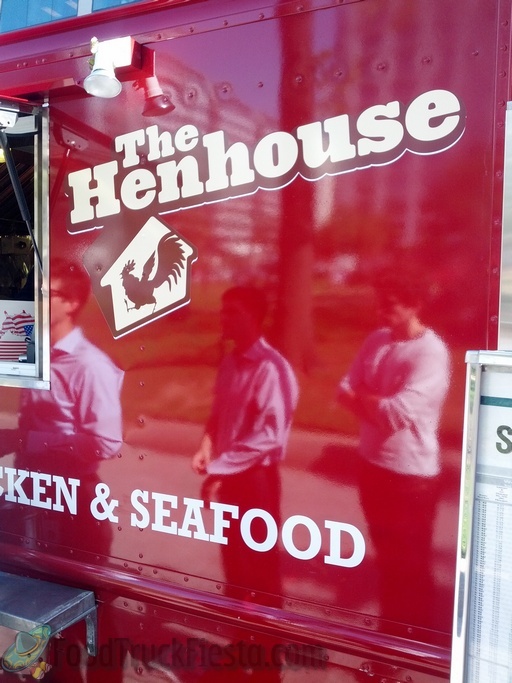 Henhouse serves a chicken and seafood menu that is identical to its sister truck, Tasty Fried. 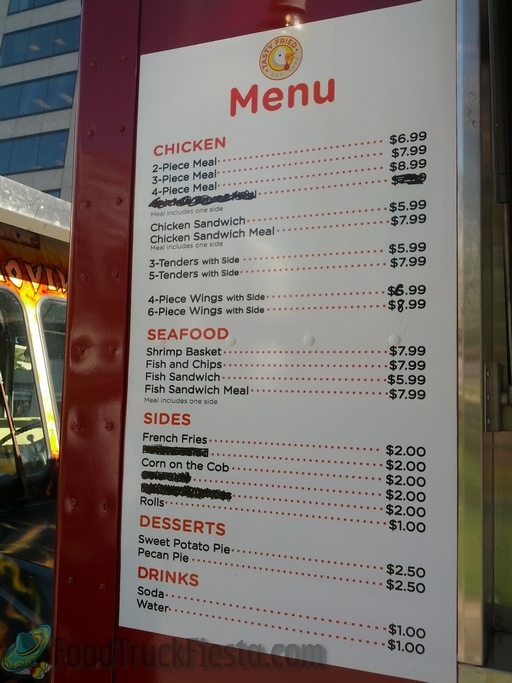 Thanks so much to Jason for sending in the photos of the truck and menu!